Don't purchase, update and maintain software! With i-linked.net you are always up-to-date. i-linked.net - Work anytime, anywhere! Paying for a CRM that’s not built for your industry? Know your Prospects and Customers Better. Quickly collect and share the data you need, in a familiar format. Avoid paper and digital clutter? All documents stored by individual record for access anywhere, anytime. Deliver sales, marketing and fulfillment to your team and prospects fast. Collect and distribute important documents. When, What, Where & How? Stay on top of your schedule and business commitments. Never miss a Call, Email or Meeting. Schedule calls, emails, and other tasks. Your contacts are your life-blood. 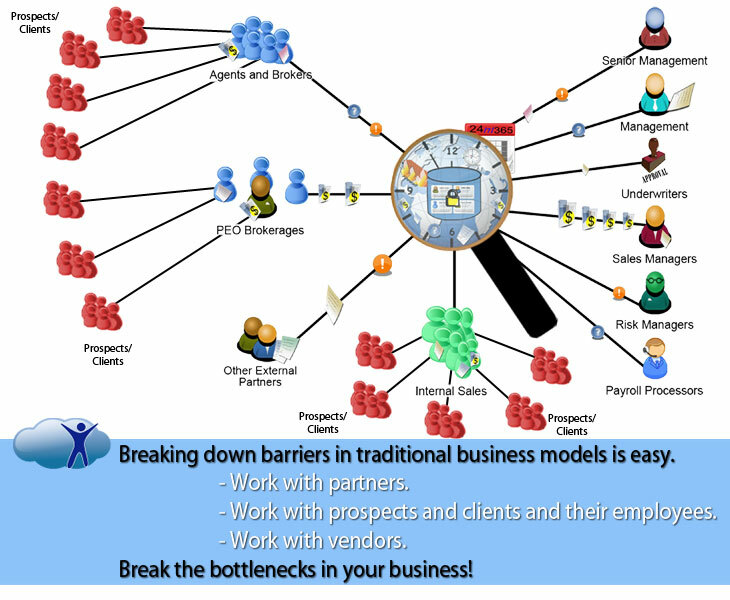 Make doing business with you easy for partners, contacts and clients. Communicate with clients, producers, and vendors in real-time with a timestamped history for accountability and performance. Forms for submissions, vendor specific forms and internal forms. Pre-fill and send in a second. Build personalized responses to activities you repeat everyday with powerful templates. Using Multiple Systems to do business? All-in-one sales, support and CRM solution for the PEO / Insurance industry. Templates. Emails. Quotes. Activities. Forms. All in one place. Data collection can be a hassle. Make the process easier for your team, prospects and partners. Need to collect and share health interview data securely. We'll help you get it done. Invite your prospect and client employees to quickly collect their data. i-geeks are standing by to build the system quickly and cost effectively. Have a complex network? What’s happening with your deals? Bring it together. Real-time updates for changes, sales status, underwriting status, alerts for every account. Always know where your deals are. Build the Team you NEED for Every Deal. Assign brokers, producers and vendors on a deal-by-deal basis. Connect with and assign the right partners for every deal in your community. Find the market, choose who you work with and never throw away a deal. Track Productivity, Profit, and other aspects of your business. Never lose track of your direction with reporting tools. Reporting by individuals, groups or company. Charts and Graphs to Gauge Performance? Graphical reporting is at your fingertips! What's Happening in my Network? Avoid calls and emails. i-linked.net will keep you informed as your deals progress. Preparing Quotes and Rates keeping you Busy? i-linked.net makes it easy to issue custom quotes and proposals in seconds. If Paying Commissions is a hassle? Your network at your fingertips! Taking advantage of your entire network! i-linked not the same business model. A new way to do more with much less! See how i-linked you grow even in declining markets. 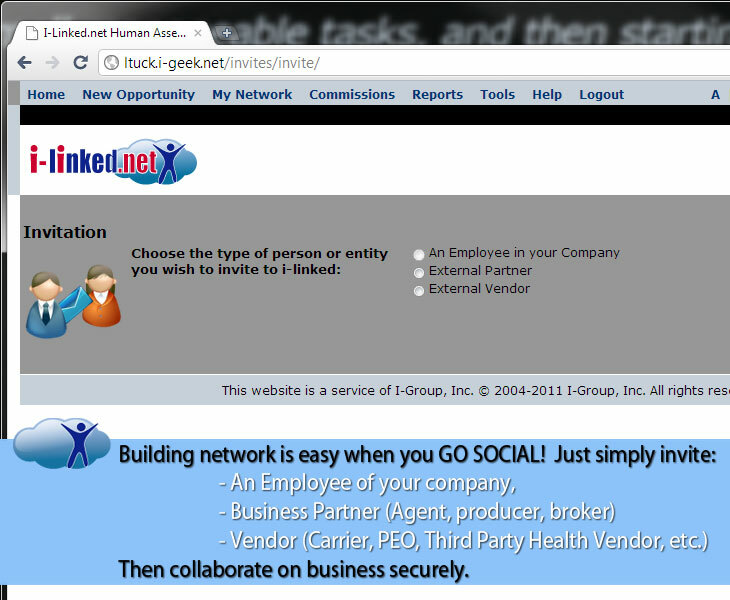 Go Social with your Business with i-linked! Expanding network has never been easier when your CRM lets you network with your partners and prospects. created one of the largest most productive brokerages in America. Up to a 75% increase in Productivity! Following our guidelines. Dynamic Employer Solutions doubled their business. Reach your trusted partners with the click of a mouse. The expansion of Partner Portals is going through the roof. Find out how i-linked.net started the trend. When you give up multiple systems for integration, you gain market scope and strength. Home | Why i-linked | Pricing | Free Trial | About Us | Demos / Tutorials| Sales Collateral Repository | Contact Us | Copyright © 2004- I-Group, Inc.